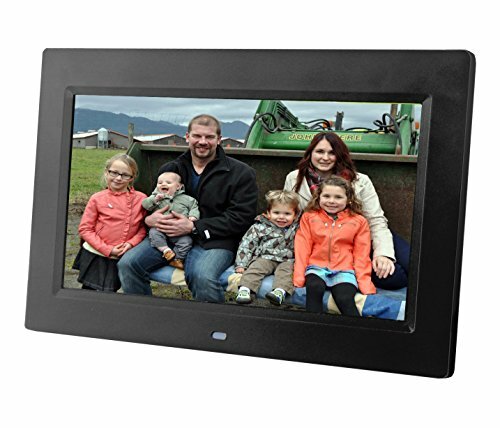 This 10" Digital Photo Frame is the perfect gift for anyone who wants to display Friends, Family and other favorite memories. Viewing photos is simple and easy. Browse through them one-by-one or play as a slideshow on the bright high definition (1024x600 pixel) 10.1-Inch LCD screen. Simply plug in a SD card (up to 32GB) or Flash Drive display your photos. Other features include transitional effects and numerous interval time options, photo rotation, and calendar/clock functions. The slim design makes it easy to place anywhere including a desk, table, or shelf top. Get this great frame with amazing display at a great price. Slim Design - Easily fit on shelf or Table top without taking up too much space / Also includes mounting hole if hanging on the wall is desired. Plug and Play Memory Support - Plug in either an SD/SDHC memory card (32GB max) or a USB Flash drive to instantly display your photos. Display Options - Choose options like transition effects, slide shows, interval time options, zoom in/out, and photo rotation. HD LCD Screen - The 1024x600 LCD screen will give crisp, clear viewing of your photos. Calendar a Clock Features - In addition to displaying your photos in full screen, you can also utilize the frame's built in Calendar and clock.